Switchable attenuators offer mechanically or electrically controllable attenuation states. There are two broad categories of switchable attenuators, switched network attenuators, and switched element attenuators. Switched-network attenuators are versatile, once you've built one you can easily change the attenuation value. That is why this approach is most often used by hybrid vendors. PIN diode switches are used to create two (or perhaps more) paths. Rule of thumb: for a switched attenuator (or gain) network, if the combined switch isolation is 20 dB greater than the desired attenuation change, the leakage through the isolated high-gain path will pull the gain of the low-gain path no more than +/- 1 dB. Example: you want a 20 dB switched attenuator. If the two SPDT switches each provide 20 dB isolation (half of 20 dB + 20 dB), then you can expect 19 to 21 dB attenuation range. This is illustrated in the plot below. 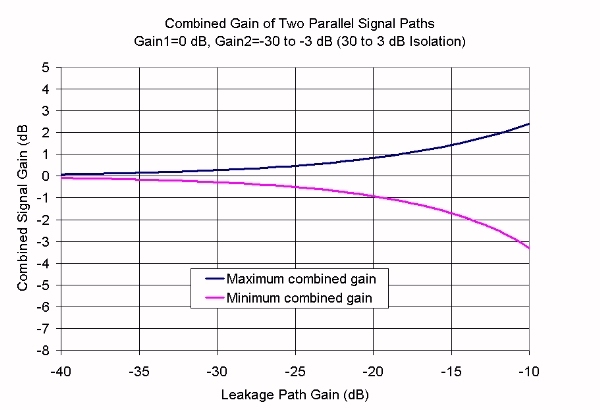 When the low gain path is -20 dB down (X-axis), the high gain state could be off +/-1 dB. This type of attenuator is more clever than the previous one, here we start with an attenuator network such as a pi or tee pad or reflection attenuator, and create resistive elements that can have two or more values. Using FETs as the switching mechanism, this scheme is often implemented in MMIC or RFIC formats. Digital attenuators are not really digital anything. They are used to provide more than one step in attenuation, usually in a sequence such as 0.5, 1, 1.5, 2... dB. Perhaps they should be called stepped attenuators. There are many, many ways to create a digital attenators. The switched element network (above) has been used in low value (less than 10 dB total range) three-bit attenuators. FETs are used to switch in different values of resistors. It is a compromise, as you won't be able to maintain the exact resistor values in a binary sequence, but nothing beats this network for compact size and low loss. For higher value bits, you can add in soome switched networks. Power handling: amount of power that will either put the attenuator into a certain degree of gain compression (i.e. P0.1, P0.5 or P1dB), usually measured at the input. Note that power handling may be quite different at different attenuation levels; usually, higher attenuation will have lower power handling. Maximum rated power: if this level is exceeded, damage may occur.